The first waterfront stage built in South Portland or Westbrook will be the only one, an official predicts. 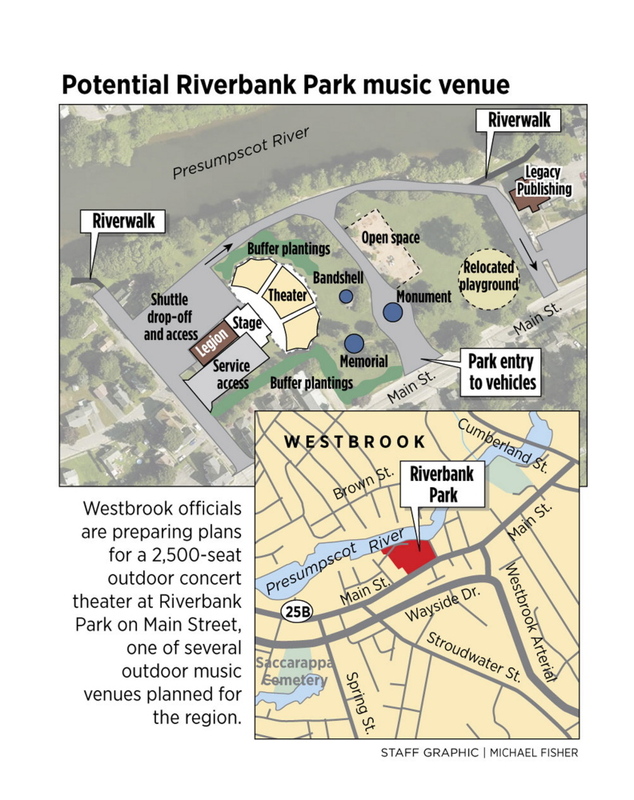 Waterfront concert venues planned in South Portland and Westbrook could be in a race to get up and running. While a developer prepares to make a proposal to South Portland’s Planning Board for a 10,000-seat outdoor theater overlooking Portland Harbor, Westbrook officials are negotiating with an unidentified concert promoter about opening a 2,500-seat pavilion on the banks of the Presumpscot River in downtown Riverbank Park. Baker publicly revealed Westbrook’s plan for the first time this week, after news broke about new developments in the proposal for South Portland. Those involved with that project said they hadn’t heard about Westbrook’s plan, but it wouldn’t affect their own. In Portland, an outdoor amphitheater is in the latest plan for a $110 million mixed-use project on Thompson’s Point. “When it rains, it pours,” said Lauren Wayne, the concert promoter who brought Mumford & Sons to Portland’s Eastern Promenade two years ago. That show, which drew about 15,000 people, has driven some of the interest in outdoor concerts, but even more influential is the success of the Darling’s Waterfront Pavilion, which opened in Bangor in 2010. A study by a University of Maine economics professor showed that venue’s economic impact on the city had been about $30 million as of 2012. Officials from South Portland and Westbrook cite Bangor’s venue as a model for their plans. Baker said Westbrook’s staff has been working on bringing an outdoor pavilion to Riverbank Park since last summer, “taking a longer, slower look at the idea” than South Portland. The plan has yet to be presented formally for city approval or funding. The University of Southern Maine has done a feasibility study that shows the venue is possible to build and aligns with Westbrook’s goal of developing its riverfront, and has the potential to infuse $7 million a year into the city’s economy. Span Systems Inc. of Manchester, N.H., has given the city a proposal to design and build an amphitheater at a cost of $420,000 to $1 million. Baker said the idea is for the city to pay for the venue through revenue-sharing with concert promoters, and to recoup its investment in two to four years. So far, he said, the city has spent less than $400 on the project. South Portland officials said in October that they had been looking into developing a 10,000-seat performing arts center at Bug Light Park, on land the city would lease from Portland Pipe Line Co. 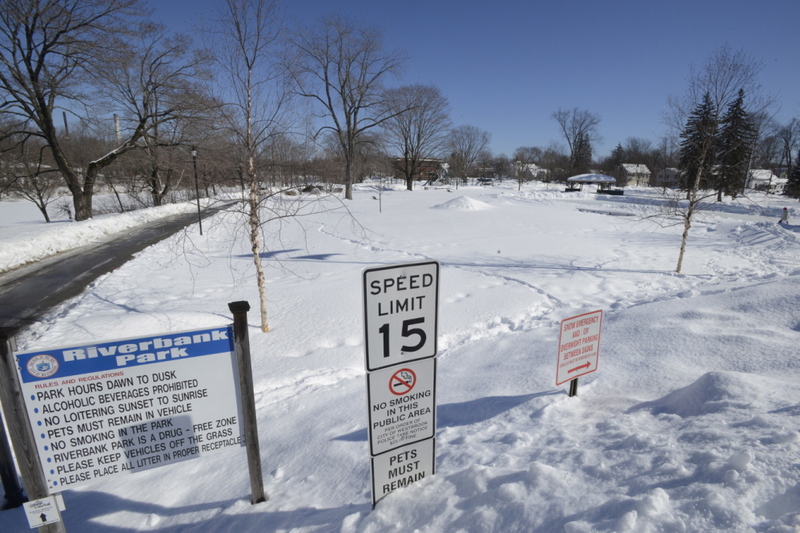 The site has since shifted to a lot adjacent to the park, owned by John Cacoulidis, a developer whose representatives are expected to bring a proposal to the South Portland Planning Board on Tuesday. South Portland Mayor Jerry Jalbert said the idea of leasing land from Portland Pipe Line “became a little uncomfortable to pursue” while the company was battling with environmentalists over an ordinance to prevent imports of so-called tar sands oil into the city. The new site probably wouldn’t provide a permanent solution. Moulton, the representative for Cacoulidis, said this week that Cacoulidis would likely re-evaluate the use in a year or two. Regardless of Westbrook’s plan, the city of South Portland will continue working on its own, Jalbert said, although he acknowledged that unsurmountable obstacles could arise. “We’re not 100 percent sure this is even going to happen, for a lot of different reasons,” he said. Wayne, the concert promoter, said the success of each venue would depend on the details of what they offer. She said she would be more interested in South Portland’s venue because Westbrook’s would be about the same size as the State Theatre in downtown Portland, where she’s the general manager. Baker said Westbrook’s site would have an advantage over South Portland in terms of traffic flow and highway access.